How do I say "barka da shan ruwa" in English? Can I simply say "Happy iftaar?” But then I know "iftaar" is an Arabic word. Someone asked a similar question years ago. My response to your question will draw from the response I gave then. There are many expressions that are simply untranslatable to other languages because of the vastness of the socio-cultural differences between the languages. “Sannu da shan ruwa” or “barka da shan ruwa” is one such expression. A literal translation of sannu da shan ruwa (which would be “greeting on drinking water”) makes absolutely no sense in English, and an idiomatic translation of the expression in English is impossible. So if I were to meet a native English speaker who is a Muslim and I need to greet him or her after iftar, I would simply say "sannu da shan ruwa” (or, if I want to be linguistically nationalistic, I would say “bese ka noru,” which is the literal and idiomatic Baatonu equivalent to the Hausa sannu da shan ruwa) and explain what the expression means instead of trying to get an English equivalent for it, because it doesn't exist. It is conceivable, however, that in the near future, if enough Hausa people live in environments where English is a native language, these kinds of unique socio-cultural phrases will be literally translated into English and adopted by the speakers—if such phrases fill a cultural and socio-linguistic void. That was what happened with the expression “long time no see.” It is a direct translation from Chinese, which makes no grammatical sense in English. Another example is the phrase “enjoy!” often uttered in (American) airlines and restaurants after people are served a meal. It’s an attempt to translate the French “bon appetit,” which would literally translate as “good appetite” in English, but which actually means “enjoy your meal.” It’s a unique French sociolinguistic quiddity that English speakers now have a need to mimic because of French cultural influence. (Native English speakers don’t traditionally utter any special expression before meals). Nevertheless, it might help to know that English-speaking American Muslims usually say “happy iftar,” or “wish you a joyous iftar,” during the feast after fast. 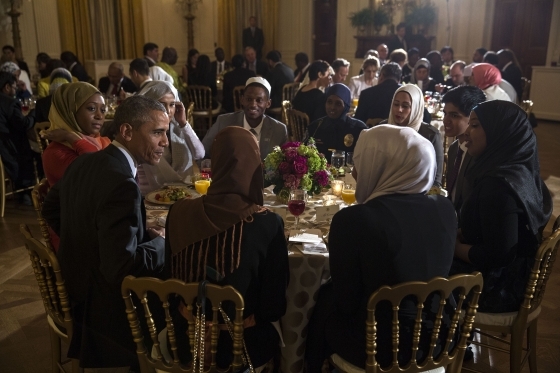 Thankfully, “iftar” has entered American English lexicon because of the annual White House Iftar Dinner started by Hillary Clinton in 1996 when she was First Lady. Many thanks for your articles which I have always found refreshing and enlightening. I would like to know if the word 'counsel' (as in lawyer) can be pluralised with the addition of an 's.' A colleague of mine insisted it cannot. What is the true position? It is true that "counsel" is an invariably plural noun, which is treated as an uncountable noun that does not admit of an “s” to form a plural like "news," "advice," “equipment,” “furniture,” etc. If you want to pluralize it, say "lawyers" or "attorneys." But different groups of lawyers can be called counsels. Can you tell me why the article "an" is used for acronyms that don’t start with a vowel? For example, a recent New York Times article used "an SEC...." instead of “a SEC…” even though “s” is a consonant. So it’s “an NDA graduate,” (not “a NDA graduate”-- even though “n” is a consonant-- because “N” is pronounced “en”), an “MC at a ceremony,” (not “a MC at a ceremony”), “an SUV” (not “a SUV”). In wishing people happy birthdays, many Nigerians say they wish celebrants "many happy returns." I suspect that it is incorrect, that it is nonstandard English. Am I right? You are right. “I” is the subject of the sentence, and “I” always agrees with a plural verb. Thus, it should be “I, Najatu Muhammad wish to…” However, if the sentence had been “Najatu Muhammad wishes to…” it would have been correct because the subject would be “Najatu Muhammad,” which is a singular subject. The same principle applies to the singular “you.” You don’t say “You is a kind person”; you say “you are a kind person” even though you are making reference to a singular “you.” In many nonstandard English dialects in Britain and America, however, “you” and “I” agree with singular verbs. I think it a complete usage error when Nigerians say ''in all ramifications.'' The word ''ramification'' means an unwelcome consequence. I personally have never seen the word used in this (Nigerian) way in countries where English is spoken as a native language. You are right. A search through the Corpus of Global Web-Based English turned up 101 matches for the phrase “in all ramifications.” Of this, 82 were from Nigerian English, 13 from Ghanaian English, 2 from British English, and one each from Kenyan, Indian, and Canadian English. I am an academic with background in the natural sciences. I read newspapers a lot, do review and also publish articles in scientific journals. Your column has been of immense help to me in understanding English usage. I have a challenge, viz: Is it wrong to begin a sentence with a number? For example, are these sentences correct: 1.25m people die in road crashes...', '7 die in Lagos..' and '9 million naira..' etc. Thanks for your kind words. There is nothing grammatically wrong with starting a sentence with a number. However, many style guides discourage it. So, to be safe, try to avoid starting sentences with numbers. Either write the numbers in words when they begin a sentence or let a phrase precede them, such as, "Authorities said 1.25 million people die in road crashes."